Presenters and attendees unite to elevate poverty and for a quick photo. 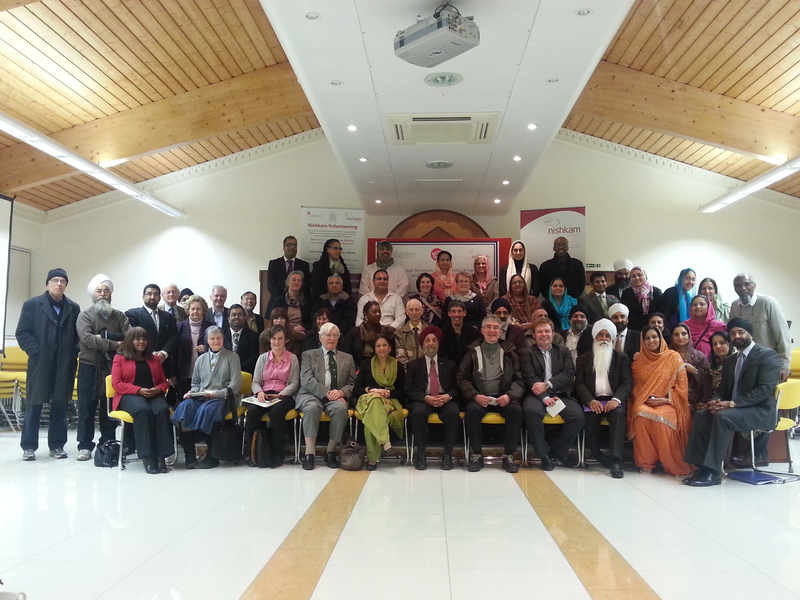 In the dawn of World Interfaith Harmony Week (3-9 February 2013), the Nishkam Centre became the setting for a diverse gathering of communities, voluntary and faith organisations, who came together to discuss ways in which interfaith activities can help solve the challenges of poverty in Birmingham and beyond. The event included stalls, video presentations and talks from a host of speakers representing a range of communities, who reaffirmed their commitments to mutual understanding and interreligious dialogue, in helping elevate local poverty. The event was broken down into three main areas which questioned, ‘what is poverty and how it affects us in Birmingham’, what is Birmingham doing to tackle the problem’ and How can faith relieve poverty’. Engaging faith in regeneration was a key topic for the talks from various champions of faith and service across Birmingham. Guest speakers included, Bhai Sahib Dr Mohinder Singh, Chairman of the Nishkam Centre, Abdullah Rehman from Balsall Health Forum, Monsignor Canon Daniel McHugh, the Archdiocese of Birmingham, Amrick Singh Ubhi, Director of the Nishkam Centre, Ravi Ladva from the Birmingham Hindu Council, Dr Andrew Smith Interfaith Director for the Archbishop of Birmingham and Cllr John Cotton. Bhai Sahib Dr Mohinder Singh, who last year was created a Knight of St. Gregory the Great by the Holy Father Pope Benedict XVI, and also delivered a passionate message of common ground to realise working for the common good at the United Nations, said: “We need cohesion, because we all report to one God and we are part of large global family. We have to have unity and respect for each other, feeling the pain and suffering of others. “Unity and cohesion starts at home. There is need for strengthening the sacred institution of marriage. If there is no cohesion between the couple, then there will be no cohesion in the family, which is the center of our values. “The role and leadership that the global interfaith movement has provided to address the UN millennium development goals and finding peaceful solutions to prevent conflict, provide us with a great deal of optimism. However, restoring the honor and dignity of religion and faith, is a prerequisite to furthering more interfaith engagement and corporation. 1. The World Interfaith Harmony Week was first proposed at the UN General Assembly on September 23, 2010 by H.M. King Abdullah II of Jordan. Just under a month later, on October 20, 2010, it was unanimously adopted by the UN and henceforth the first week of February will be observed as a World Interfaith Harmony Week. 2. The Nishkam Civic Association, more fondly known as the Nishkam Centre is one of the five Centres for Excellence created by the faith-based charity, Guru Nanak Nishkam Sewak Jatha. Chaired by Bhai Sahib Dr. Mohinder Singh Ahluwalia, who holds two honorary degrees from the city’s universities, it aims to serve and uplift society through the practice of core values – ‘nishkamta’, or the spirit of selflessness, being one of them. Inspired by spirituality, the organisation has generated a flourishing culture of volunteering, which has contributed immensely to transform its visionary projects into a reality.